Dear Readers: This essay is adapted from Crystal Ball managing editor Kyle Kondik’s new book, The Bellwether: Why Ohio Picks the President, which is now available. As the nation turns its eyes to Cleveland next week, Kondik explains why his home state is seemingly always a reflection of national presidential voting and a major prize in any competitive election. The Crystal Ball will publish a special issue with reaction to Donald Trump’s vice presidential pick after he announces the selection. Every four years, Ohio voters end up speaking for more than just themselves, whether they realize it or not. While Ohio is not always or even often the single state that decides who becomes president of the United States, its consistent presence near the average national voting has cemented its reputation as one of the key states in presidential politics. Ohio almost always votes fairly close to the national average, and the winning candidate almost always carries the state by a margin that mirrors the national winning margin. As the political world descends on Ohio next week for the Republican National Convention in Cleveland, and then keeps its eyes trained on a state that will enjoy (endure?) dozens of visits from the candidates and millions upon millions of dollars in campaign spending, it’s worth taking a look at why this state has so consistently reflected the national voting. 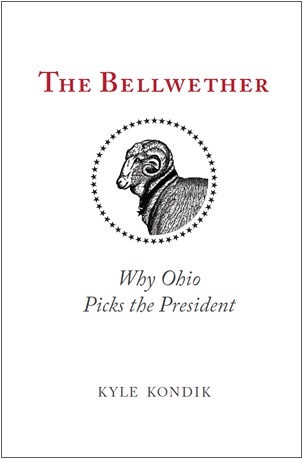 That’s the subject of my new book on my home state, The Bellwether: Why Ohio Picks the President. Ohio has voted for the winning presidential candidate in 28 of the past 30 elections, dating back to 1896 (the exceptions were 1944 and 1960). That’s the best “winning percentage” of any state over that timeframe. Additionally, the state has deviated on average only about two points from the national two-party voting over the same period, making its voting more reflective of the national average than any other state. 1. Ohio is and always has been reflective of the nation. While Ohio was the 17th state admitted into the Union, it was in some ways the first state that was “typically American,” as the Great Depression-era Ohio Guide described it. From its founding, Ohio featured “the characteristics and habits” of the nation as it was as a whole. The Western Reserve — Cuyahoga County (containing the city of Cleveland) and its neighbors in the northeastern part of the state — was once part of Connecticut. It was largely settled by people from Connecticut and other Northeastern states. Northeast Ohio, even today, votes a lot like Connecticut does. A big part of the central and southwestern parts of the state were reserved for Virginia military veterans. This Virginia Military District was settled by Southerners. The middle of the state was largely settled by people from the Middle Atlantic and other parts of the country. American politics, particularly after the Civil War, became something of a battle between the Northeast and South, with states like Ohio — which had elements of both North and South — acting as battlegrounds. While the parties have realigned, with the Northeast allying itself with the West Coast and trading its Republican allegiance for the South’s Democratic loyalty, Ohio has remained tethered to the nation’s political center. Ohio is home to members of many different American cultural and political tribes, but it is dominated by none of them, which helps explain the state’s political competitiveness, a trait that has defined the state for much of its history. 2. Ohio has no dominant city or region. Unlike states like Illinois — dominated by Cook County (Chicago) — or New York — dominated by New York City’s five boroughs — Ohio does not have a leading region or city. And Ohio’s three major urban counties, combined, aren’t as Democratic as those in other states. Let’s compare Illinois, a strongly Democratic state that Barack Obama won by 17 points in 2012, to Ohio, a competitive state Obama won by three points. That election, Cook County cast 38% of all the votes in Illinois, and Obama won it 74%-25%. In Ohio, Cuyahoga (Cleveland), Franklin (Columbus), and Hamilton (Cincinnati) cast just 29% of all the state’s votes, and Obama won these three counties combined by a 62%-37% margin. If one removes these counties from both Illinois and Ohio, the rest of each state voted for Mitt Romney by about five points in 2012. The difference between the two states is that Illinois is dominated by Chicago, while Ohio is not dominated by any of its three major cities. Ohio looks like the rest of the country in that most of its counties are Republican, but its population centers are generally Democratic. There are just 10 of 88 counties that were 55% Democratic or more in the last four presidential elections: Cuyahoga and a number of other northeastern counties, along with Franklin, Lucas (Toledo), and Athens in the Southeast (home to my alma mater, Ohio University, which since 18-21 year olds got the right to vote starting in 1972 has been a strongly Democratic enclave). Twenty of the 88 were swing counties, where Democrats got between 46%-54% of the vote. Examples include Stark (Canton) and Montgomery (Dayton), two counties in Ohio that historically vote fairly close to the state and national voting (however, no Ohio county votes closer to the national average than the state does as a whole). And 58 of the 88 were more than 55% Republican. This includes many rural counties in the western half of the state and the growing “collar counties” that surround Franklin and Hamilton counties. In 2012, Obama won just 17 of 88 counties in Ohio (19%). Nationally, he won just 22% of all counties. So Ohio’s political makeup — lots of rural and suburban Republican counties with a relative handful of Democratic centers — mimics the nation’s, too. Here, in order of size from biggest to smallest, are Ohio’s Fortune 500 companies: Kroger, Marathon Petroleum, Cardinal Health, Procter and Gamble, Nationwide, Macy’s, Progressive, Goodyear Tire and Rubber, American Electric Power, FirstEnergy, Parker Hannifin, L Brands, Sherwin-Williams, TravelCenters of America, Owens-Illinois, Dana Holding, Omnicare, AK Steel Holding, Fifth Third Bancorp, American Financial Group, J.M. Smucker, Western & Southern Financial Group, and Owens Corning. What do those companies have in common? Not much. It’s a diverse group, featuring a variety of energy companies, insurers, banks, manufacturers, and retailers. And that doesn’t include the state’s public sector and nonprofit employers, like Ohio’s many colleges and universities as well as its hospitals, an impressive list led by the Cleveland Clinic, the logo of which visitors to the Republican National Convention will see all over the city. Ohio is not just a cultural and political melting pot — it’s an economic one, too. Politicians don’t look at it as a coal state, like West Virginia, or as an agriculture state, like Iowa. Fluctuations in these industries don’t resonate statewide because while the state has, for instance, mining and farming, these industries aren’t really part of Ohio’s statewide identity. Additionally, the state does not have a driving political ideology. While state politics, particularly recently, skews Republican, the state has had major political figures of all different ideologies. Ohio’s two senators, Rob Portman (R) and Sherrod Brown (D), are, respectively, a strong conservative and a strong liberal on most issues. Their shared trait is a good sense of timing: Brown won his two statewide elections in good national Democratic years (2006 and 2012), while Portman won in the 2010 Republican wave (we’ll have to see how his timing is this year as he stands for reelection). Some of the other major Ohio politicians of recent vintage include Gov. John Kasich (an ideological conservative who ran as a moderate in the recent GOP presidential primary), former Sen. George Voinovich (a Republican with a moderate streak), and former Sen. Howard Metzenbaum (a strong liberal Democrat). Those are just a few examples: Ohio has long produced statewide leaders of vastly different ideologies who ascend to high office thanks to a combination of skill and luck. That points to a state whose electorate isn’t consistently ideological at all: Perhaps that helps explain why political scientist John H. Fenton argued in the 1960s that Ohio has “issueless” politics. But, actually, Ohio’s elections — at least at the presidential level — are fairly easy to understand. The state typically votes at or near the national average, with just a very small Republican lean. That’s why the state is so important to Republicans: Since 1856, the start of the Republican Party as a presidential party, there have been 40 elections. The winner has carried Ohio in 35 of them, and each time Ohio voted for the loser it was for a Republican. To the extent that the state votes differently than the nation it’s usually a little bit more Republican. Historically, there’s no path to victory for a Republican who loses Ohio, because the state functions as something of a GOP gateway to the Midwest. Outside of Indiana, a Republican bastion, Ohio is typically more Republican in presidential elections than Illinois, Iowa, Michigan, Minnesota, Wisconsin, as well as Ohio’s non-Midwestern neighbor, Pennsylvania. If a Republican doesn’t carry Ohio, that candidate probably isn’t carrying any of those other states, either. At least that’s what history tell us. But maybe things will change this year. After all, Middle Voter and Ohioan Bette Lowrey looked like the exemplar of the American electorate in 1970. Yet in 1972, she voted for George McGovern, one of the biggest landslide losers in American presidential history. Ohio has spent the last 30 presidential elections, and others before that, generally voting close to the national average. But there’s no guarantee that it will continue to do so. Other states, such as Illinois and Missouri, had longstanding reputations as bellwether states, but in recent years they have trended away from the nation’s political center (Illinois toward the Democrats, Missouri toward the Republicans). Perhaps Ohio will do the same at some point, even though there’s little indication that the quintessential bellwether is moving away from the national average.